Another recent discovery from Further Confusion and the My Dreamy Star web site: Anaria, written and illustrated in full color by Jayelle Anderson. “What was once a pastoral world is quickly changing with the rise of the technomages and the decline of the old elven regimes. New threats are rising and the races of Anaria must unite to defeat them or fall to the dark illness spreading throughout the nations. Kaylee Laturell is a kind healer and sun witch who has to confront the enemies of her past in an unexpected way to save their future. 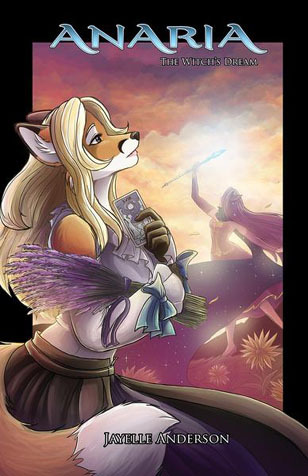 ‘The Witch’s Dream’ is the first chapter in a bittersweet tale of friendship, loss, and love.” As you can see from the cover of the first on-paper edition, anthropomorphic characters are very much a part of the magic in this world! Anaria is also published as an on-line comic at My Dreamy Star.